Happy Wednesday and welcome to midweek. 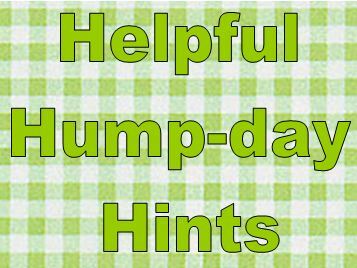 I have links today that are my Helpful Hump-day Hints. As we on the East Coast prepared for Sandy to hit, I went to the Red Cross website to see what they said we should have prepared. I found a wealth of information! Click here to view The American Red Cross Disaster & Safety Library. Here you will find checklists to help you prepare for an earthquake, a flood, a house fire, a hurricane – and anything else you can think of! Many are also trying to save gas in their cars these days. Whether you have been affected by the hurricane and gas supplies are low or you just wish you weren’t spending so much money on gasoline read this article from ALL YOU magazine: How to Make the Gas in Your Car Last. Lastly, many were charging all their electronics for hours and hours before the storm hit to try and save any battery they had before power started to go out. Here is an article that Nine Ways to Make Your Cell Phone Last the Whole Storm Even if the Power Goes Out. Of course, I hope you never have to use these checklists, but it is always best to be prepared. Best Thanksgiving Ever – Pin & Win Sweepstakes!